Did you know the library offers a deal for movies on Thursdays?? It’s 2 for $1 day! It’s good in both the Children’s Room and the AV room so take some of each. Spread the word! The best deal in town got even better on Thursdays. This novel, loosely based on the life of Boston mayor James Michael Curley, tells the story of a longtime mayor in an unnamed East Coast city, his attempt for re-election, and the end of a political era. While hiking in Maine and wanting some peace away from her brother and mother, Trisha gets lost in the woods. All she has for company is her walkman radio and she spends the time listening to Red Sox broadcasts, featuring her the exploits of her favorite player, closer Tom Gordon. A must for late 1990’s Red Sox fans, devoted listeners to Joe Castiglione, and anyone who knows the Giant Glass jingle by heart. Fifty year old Alice Howland, a Harvard professor, finds her life changed when she is diagnosed with Alzheimer’s. Lisa Genova is a native of Waltham. Father Dom of Revere recounts four days in the life of the Revere based Imbesalacqua family, through the voices of the family members and their extended associates. Three friends from Brookline, TC, Augie, and Alejandra, write about their ninth grade year. The book is written in alternating viewpoints and features e-mails, diary entries, as well as traditional narratives. Fun fact: TC’s full first name is Tony Conigliaro. This is the classic soap opera novel, detailing the lives of Peyton Place, a fictional New England town. Two young men, adopted as babies, and named Tip and Teddy by their political father, have an encounter with their birth mother, when she pushes Tip out of the way of an oncoming vehicle on a snowy night in Boston. Arthur Winthrop, a headmaster of a prestigious boarding school in Vermont, is found wandering naked in Central Park in New York City. Alice Barrow works at a Lowell mill in 1832 and becomes involved with the mill owner’s son. Everything is thrown into array, though, when her best friend is found murdered. In 1926, two teachers from a private school in Chatham begin a torrid affair which leads to murder! This is the story of Lawrence and its residents, as told over a 100 year period. One year ago today, I was at the Red Sox game with my father and my good friend getting very excited about a walk off win. My father and I, still ecstatic about the game, walked over to Kenmore Square to cheer on the Marathon runners. Suddenly I saw police officers run towards Commonwealth Avenue, which was followed by a mysterious text from my friend (who had left the area after the game), asking, “You didn’t go to the finish line, did you?” When I answered that I was on the marathon route in Kenmore, she said, “Good. Did you hear about the explosion? Be safe!” Eventually, the race was stopped in the Kenmore area, and we were evacuated, instructed by emergency personnel and National Guard to walk away, not towards Downtown, and to stay away from Beacon Street in Brookline for several blocks. Walking through Brookline, we heard different stories about explosions, then bombs in Copley Square, a fire at the John F Kennedy Library in Dorchester, and various threats in the city (thus the evacuation of parts of Beacon Street). It wasn’t until I got home, that I heard the actual facts, there had been two bombs at the finish line, and that the other stories were either not related or not credible. As mildly confusing as my day had been, I could not (and still can’t) imagine the horror of those directly impacted and what they must be going through today. If you are reflecting on the first anniversary, here are some relevant resources. This comprehensive project, spearheaded by Northeastern University and WBUR, puts together a collection of photos, memorabilia, text messages, and oral histories about the bombing and related events (such as the Shelter in Place order). Users are encouraged to share stories and related objects at the site. This exhibit at the Boston Public Library in Copley Square runs through May 11 and features items left at a makeshift memorial near the site of the bombings. The Boston Public Library will also be hosting a series of events to commemorate the one year anniversary. This site, a project of various museums, libraries, and archives, including Gore Place in Waltham, offers a variety information on resources and events. The Boston Athletic Association (BAA), sponsor of the Boston Marathon, outlines important news updates on its site, including safety and security information for those attending the race. You can also check results and a course map on the BAA Marathon site. 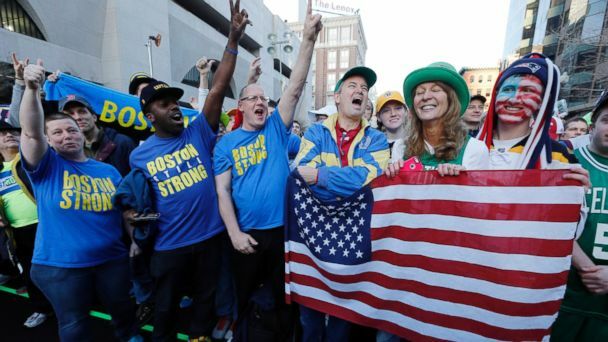 The photo of Jeff Bauman in a wheelchair and getting helped by Carlos Arrendondo, who lost both his legs in the bombings, became a symbol of the marathon bombing. Reserve his book at the library.